Here's a chance to win front-row tickets to Neil Young and Diana Krall, while supporting a First Nations community taking legal action to stop further tar sands expansion in their lands. 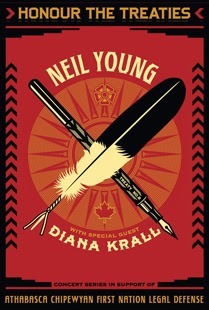 In the “Honor the Treaty” concert series this January, Neil Young and Diana Krall will perform live in Toronto, Winnipeg, Regina, and Calgary. 100% of all proceeds will go to Athabasca Chipewyan First Nations. If you weren’t able to purchase tickets to the shows, or want to support our fight from where you live, you can still be part of this historic moment and create a lasting legacy for the ACFN and all future generations by helping fund our legal efforts. Details @ Honour the ACFN. This seems cool, but they should really include more details on what could be won - what poster, what show would the winning tickets be for, what's included for travel to the show, etc. So when is the drawing??? I'm still hoping to win but I'm thinking we'll never know if there was even a winner eh?